Irrigon number 44 sets up for a pass on Friday night. 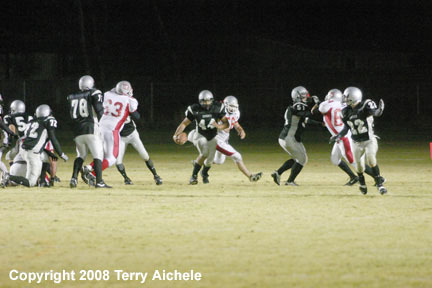 The Knights hosted Union in football action. IRRIGON - The Irrigon Knights hosted the Union Bobcats in conference action on Friday, October 24, 2008. The first quarter was a tight one with the first scoring opportunity coming with 7:02 to go in the first. The Bobcat quarterback handed off to number 3 who ran about eight yards for a touchdown. The point after was good to give the Bobcats a 7-0 lead. The next score came in the opening moments of the second quarter. The Bobcats were third down and 4 on the Knights eight yard line. Union ran a handoff to number four good for a first and goal on the three yard line. Next came a handoff to number three for a yard gain. On second and goal number three ran it in for a touchdown. The point after was good so the Bobcats took a 14-0 lead. 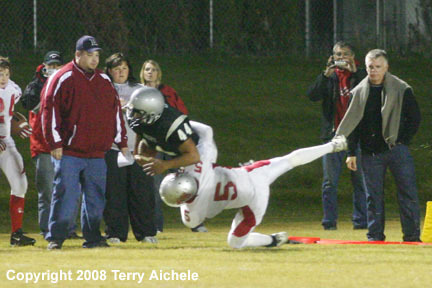 Irrigon number 44 took the ensuing kickoff to the Knights 27 yard line. 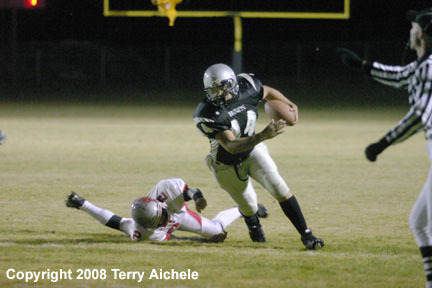 The Irrigon quarterback number 10 handed off to number 44 on a sweep left that was good for a seven yard gain. 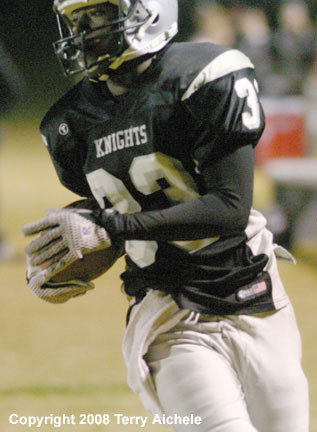 The Knights then ran number 83 on a sweep right on a 64 yard run for a touchdown 10:42 of the second. The point after was missed. This brought the Knights to within eight at 6-14. The teams exchanged possessions with neither team having a scoring opportunity. Then with about a 1:30 to go in the second Union was on the Knights 48 yard line. 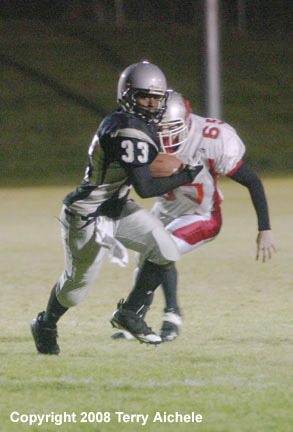 The Bobcats were third and six when the Union quarterback dropped back and threw a pass to number 5 who was ran down by the Knights on the three yard line. The Bobcats scored on the second and goal from the one to take a 20-6 lead with only 41 seconds to go in the half. The point after was good. The Bobcats went into halftime with a 21-6 lead. At halftime the undefeated fifth and sixth grade football team from Irrigon was introduced to the crowd. At the 7:02 mark of the third quarter Union was second and thirteen on the 43 yard line. Their running back number four took the ball for a big gain to the Irrigon 20 yard line. The Union Bobcats were sitting second and six on the 16 yardline when the quarterback took the ball on a keeper to a touchdown. The point after was missed giving Union the 27-6 lead. The Knights possession of the ball late in the third quarter making it to the 50 yard line at the end of the quarter. Sitting third and eleven at the 10:32 mark of the fourth the Irrigon quarterback completed a pass to number 33 good for a 38 yard touchdown play. The extra point was blocked closing the gap to 12-27. Late in the fourth the Knights picked off a Union pass their own 31 yard line. 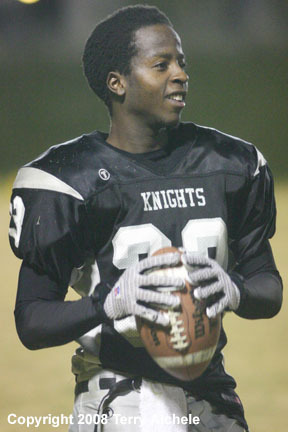 The Knights were penalized on a third and fourteen pass play for grounding the ball. That moved them back to their own four yard line and needing to punt the ball with about three minutes go in the game. The front line blocking was porrous forcing the punter to not get the kick off from the endzone resulting in a safety giving the Bobcats a 29-12 lead. The Bobcats got the ball on the 50 yard line. A series of runs and a pass moved the Bobcats inside the Irrigon twenty. 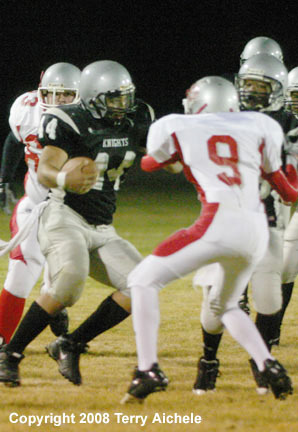 A facemasking call against the Knights gave the Bobcats the ball first and goal on the five yard line. The Bobcats scored on a five yard run. The point after was good with only 20 seconds to go. That gave the Bobcats a 36-12 lead over the Knights. That was the final score for the game. LEFT - Irrigon number 44 is tackled by Union number 5. 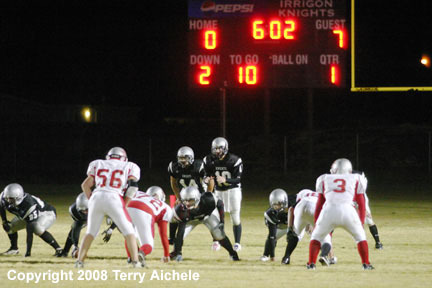 RIGHT - Irrigon quarterback number ten is set up in the shotgun formation in the first quarter of the game on Friday. LEFT - Irrigon runner number 44 on a sweep to the left. RIGHT - Irrigon runner number 44 cuts up field after a run towards the side line. 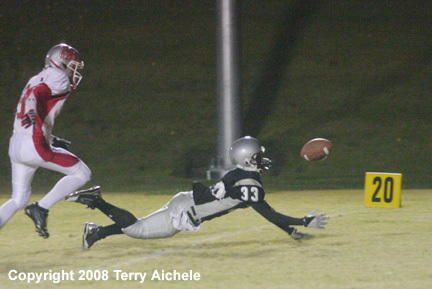 LEFT - Irrigon receiver number 33 stretches out horizontally to try and catch a pass. RIGHT - Number 44 cuts up field after getting around a Union defender. 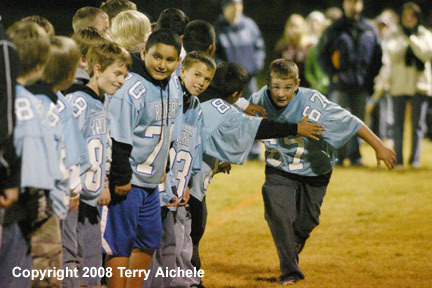 LEFT - The Irrigon fifth and sixth grade football team is introduced to the crowd at halftime of the game on Friday. 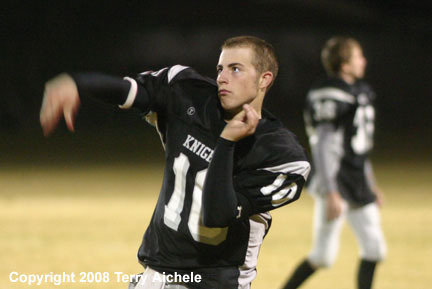 RIGHT - One of the Irrigon quarterbacks warms up just before the second half started. LEFT - Irrigon pass receiver number 33 plays catch with one of the Irrigon quarterbacks while warming up for the second half. 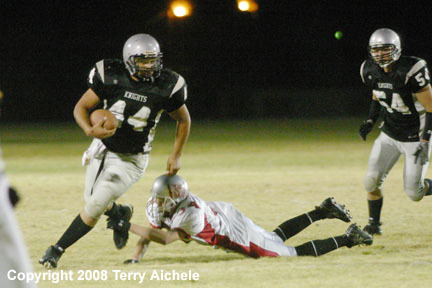 RIGHT - Knights running back number 44 is surrounded by Union Bobcats. LEFT - The Irrigon cheerleaders pose for the camera. RIGHT - The Irrigon cheerleaders performing a lift. 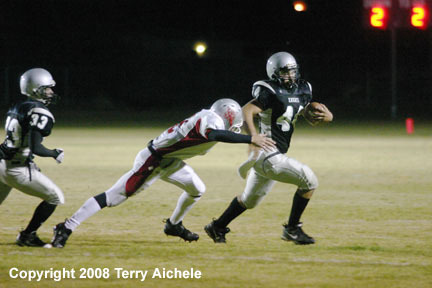 LEFT - A Union defender breaks up a pass to an Irrigon receiver. 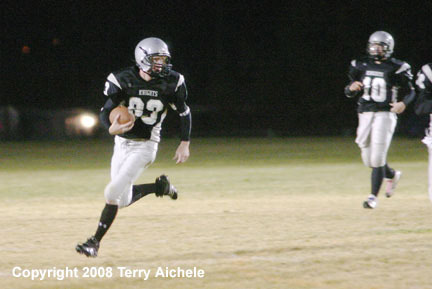 RIGHT - Irrigon receiver number 33 running after a catch. 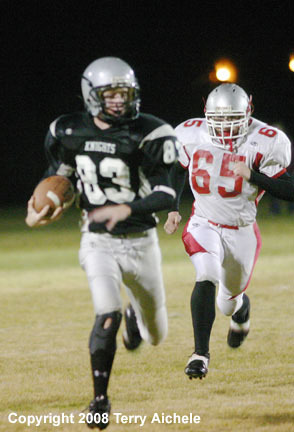 LEFT - Irrigon receiver number 33 is chases by Union defenders. RIGHT - Irrigon number 44 on a run. 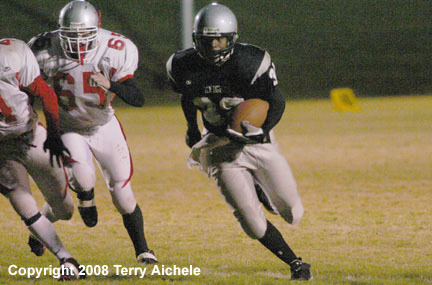 Irrigon running back number 44 carries the ball against Union defenders.